SFEON online appeared eight days ago and straight away it joined DavidNews.com Standard listing with $200 reinvestment. I'm sure you will agree that owner of SFEON has begun this project at the right time because there is not that much good looking competing projects around for it. Another essential point is that project have an attractive investment plan and on the top of all comes quality design what undoubtedly will attract a lot of players and if numerous players will join here then there is high chance that administration will pay out agreed profit to the biggest part of investors. 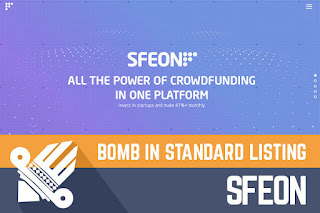 From the start, SFEON is listed in the Standard listing, and it is possible that it is a strategy from administrator because when the project will grow it will climb to higher listing since SFEON does not look like a project that do not have capital. Each administrator has his approach how to develop HYIP projects, and perhaps quiet start is the right path for SFEON owner. Administrator privately acknowledges that some influential MMM India leaders are waiting for green light to promote this project as well. However, I do not know if that is true, but if that is true than project could grow enormously huge. Seems that all great projects these days have automatic payments. Also, SFEON is no exception; it will pay all payments automatically to your e-currency account or Bitcoin wallet. You just register an account, make a deposit and profit will arrive at your purse for 21 working days. As you guessed already investment term is 21 business days, and the project will pay you 7% up to 7.9% daily (initial deposit included in the payments) what will make for you starting from 47% pure profit if everything will work as promised. When you register your account, please write down your credentials because the project will generate a signature what will be like a key to enter your personal account. For now personal account as well as the whole web page is available in English, but I have seen some texts in Russian and I have this feeling that new languages might be added to this site soon, I'm looking forward to that. Administrator wrote in a private e-mail that new translations will appear soon one by one, and I hope that actions will confirm that. Additionally, in the account area, we can see interesting "request a callback" option for English, Russian and Hindi speakers what I did not try out, but if you will, please let us know in the comment section your experience. I like almost everything about this project, but there is one thing that I did not like about this project; I was not able to connect to this page ordinarily. With this, I mean that somehow with my regular internet connection I was not able to open SFEON and I was forced to use VPN, but with VPN also I needed to find IP address that would work. I think that server of this website has some advanced connection filters installed, but to be honest, if I can't connect - most likely many other persons also can't and that is not good for such project. To summarise, I want to say that there is much to like about this project, and I think that projects like this that do not look like typical HYIP projects is the future of our industry. Yes, some things are missing, for example, advertising materials, but I'm sure they will be added gradually as this project will gain momentum. Apart from all good words, remember our golden rule - always spend with caution and invest what you can afford to lose. Did you think about trading with the ultimate Bitcoin exchange service - Coinbase.